Combined losses of South Korean companies that had to withdraw from the inter-Korean industrial park in North Korea a year ago due to soured relations between Seoul and Pyongyang have mounted to 1.5 trillion won ($1.3 billion), their representative body said. 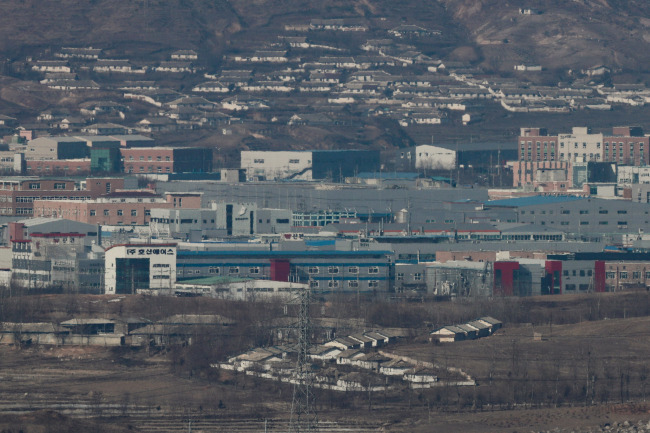 The 123 South Korean manufacturers who hired North Korean workers at their factories in Kaesong, located 58 kilometers North of Seoul, were unable to bring their buildings, machines and raw materials during the evacuation shortly after the Ministry of Unification announced on Feb. 10 last year that Seoul will close the Kaesong Industrial Complex. The shutdown was the Park Geun-hye administration’s immediate response to Pyongyang’s test firing of a long-range missile and running its fourth nuclear test. The association of South Korean firms in Kaesong industrial park said the combined 1.5 trillion won losses include 593.6 billion won in assets such as buildings and machineries, 245.2 billion won in raw materials such as fabric, 148.4 billion won in penalty fees for not delivering the promised products and 314.7 billion won in operating losses. Among the 123 firms, 75 continued their business in other factories located in South Korea and another 36 managed to re-subcontract to supply preordered goods, the association said. Eleven firms completely shut their business. The association claims that the government has compensated only 32 percent of the combined 1.5 trillion won loss. “The government has not provided any support for operating losses, penalty fees for breaching contracts and estimated losses from damage in sales rights that were incurred during the past year,” an official at the association was quoted by Yonhap News Agency. In August last year, the Unification Ministry said the government could not compensate their losses 100 percent because part of their losses could be covered by their respective insurance policies. However, officials at Kaesong firms are strongly demanding full compensation, saying their financial losses resulted from the government’s change in inter-Korean policies. The Kaesong industrial park, launched in 2000 under the Kim Dae-jung administration’s strong drive to promote inter-Korean exchanges, started with a $14 million production in 2005. The production volume at the park surged to $469 million in 2012, with the number of South Korean companies in Kaesong rising to 123 from 18 in 2005, according to government data. The number of North Korean workers hired by South Korean firms in Kaesong surpassed 50,000 in 2012. North Korean workers received a monthly wage of $110 on average in 2011. The industrial park has suffered a series of glitches since a South Korean tourist was shot dead by a North Korean soldier after purportedly wandering into a restricted zone near the mountain Geumgangsan in July 2008. After President Park Geun-hye, a hard-liner on Pyongyang, took office in February 2012, North Korea shut down the Kaesong park in April that year. After five months, the industrial park resumed operations. However, the Park administration decided to close the park in February, 2016, and the North expelled South Korean officials from the park in the same month.